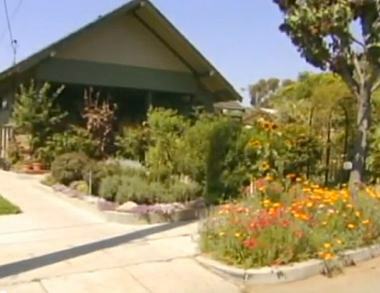 In the Los Angeles community of Pasadena — a suburban mix of nice restaurants and well-tended front lawns — there is a home wedged in among the other houses where the entire front yard is edible. A man’s little family farm, in the midst of American suburbia, is his way of breaking free without really going anywhere. His property has became quite beautiful, and the independent family of five sells what it doesn’t eat to local restaurants. None of the grown children or their parents have jobs other than working to grow food and raise chickens. Thanks to Rob Kanzer for sending the story idea!